Mr. Kim Chee and I were trying to decide what to have for dinner one night. He suggested a lot of things (some of which, admittedly, included Kraft Mac and Cheese and takeout pizza), but what I was really craving was something meaty, hearty, and tasting of BBQ sauce. I scoured some old cookbooks and found a recipe resembling what I wanted--so I made it, with a few changes/additions of my own. 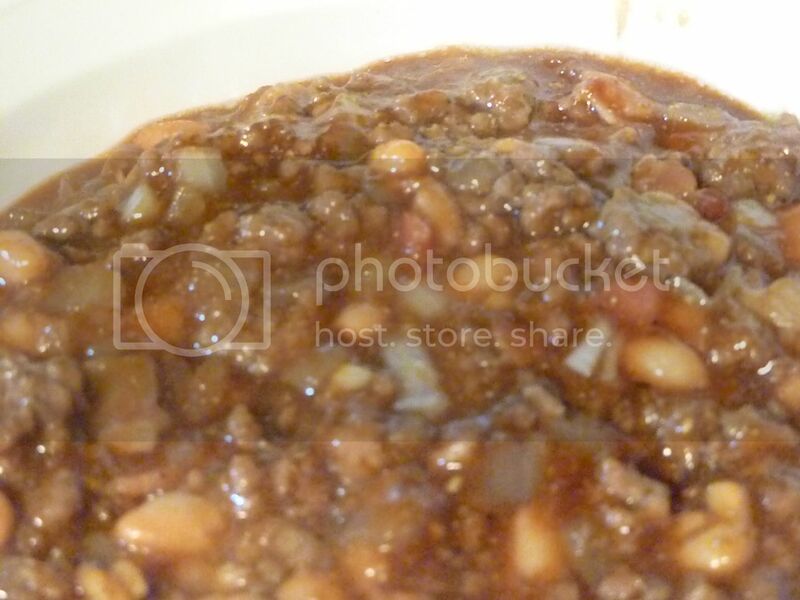 The first thing you do to make Cowboy Beans is grab some bacon. 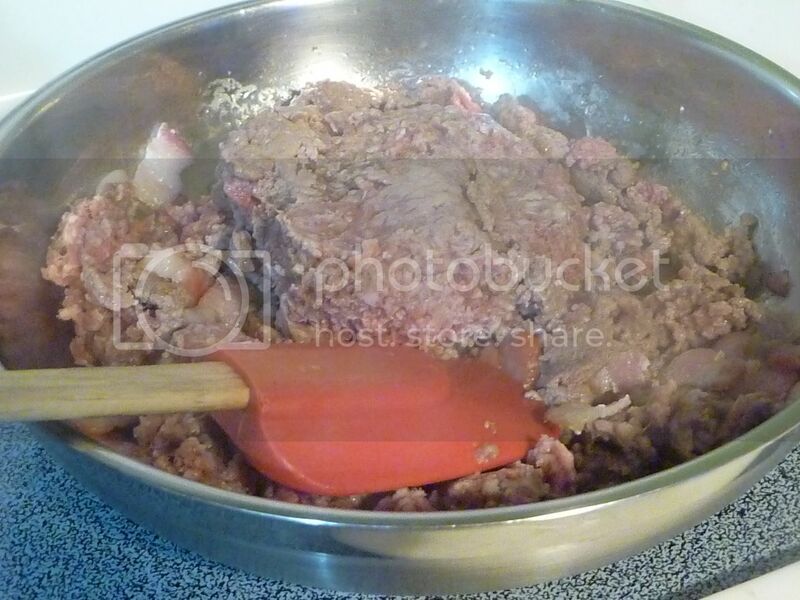 Roughly chop it, and toss it in a pan to render out the fat. 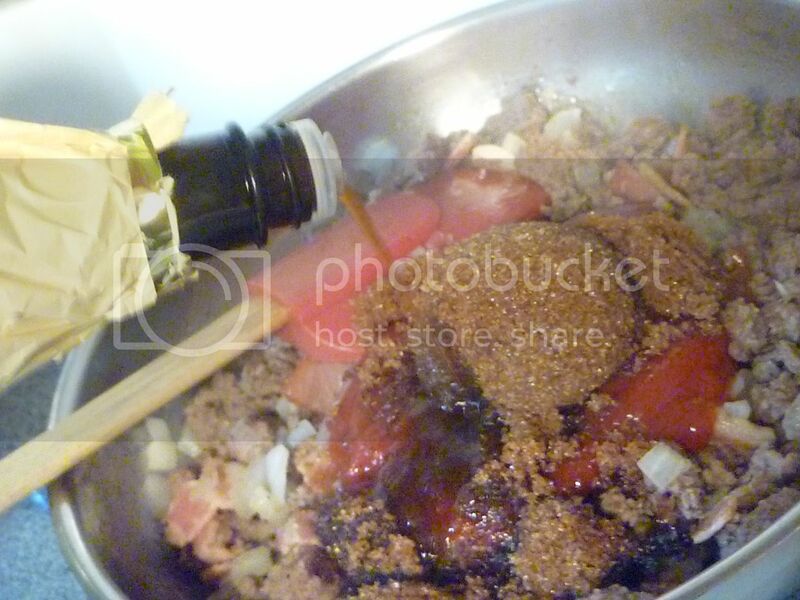 Once the bacon starts to get brown (but not real crispy), add some ground beef. 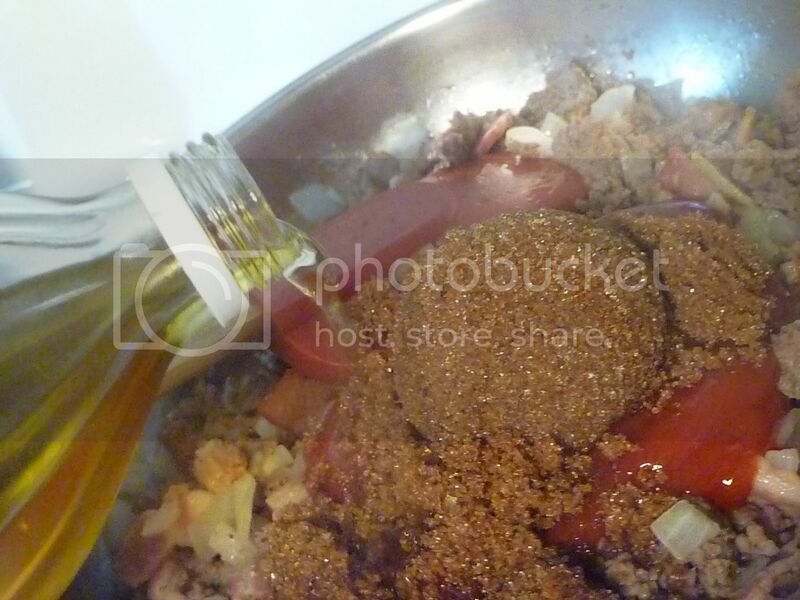 Dice an onion, and add it to the bacon and beef. And don't forget to salt and pepper. 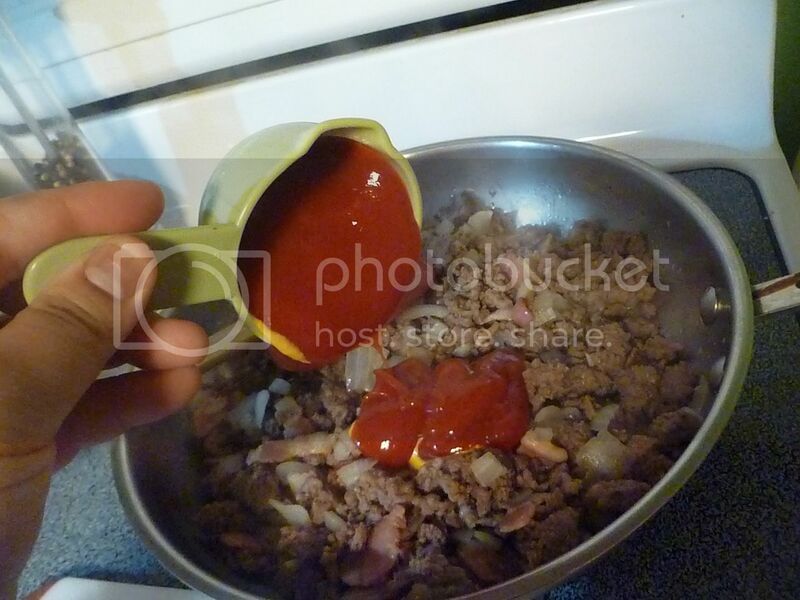 While the onions saute, measure some ketchup and mustard. 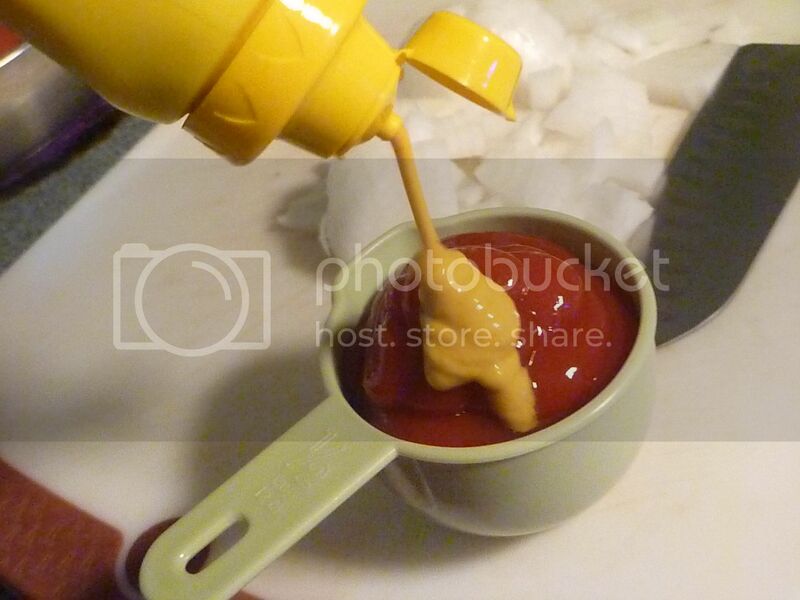 Or measure the ketchup and mustard while you wait for the beef to brown. I can't keep my pictures straight. 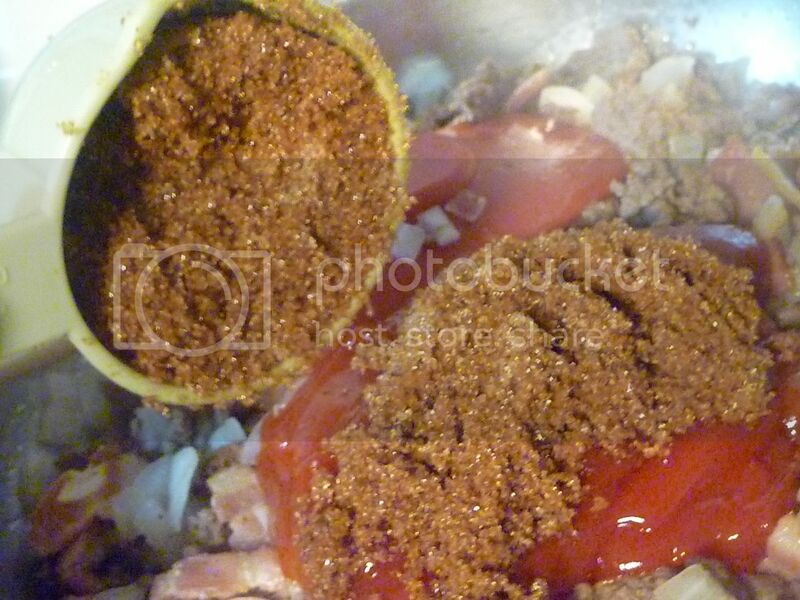 Anyhow, once the onions are softened, you can add the ketchup and mustard. Measure and add some nice brown sugar. Splash in some cider vinegar. I love cider vinegar so much. It makes things taste so good. Finally, some cornmeal will help thicken your beans up and add some body. Looks kind of like a mess, huh? It'll all turn out deliciously, don't you worry. 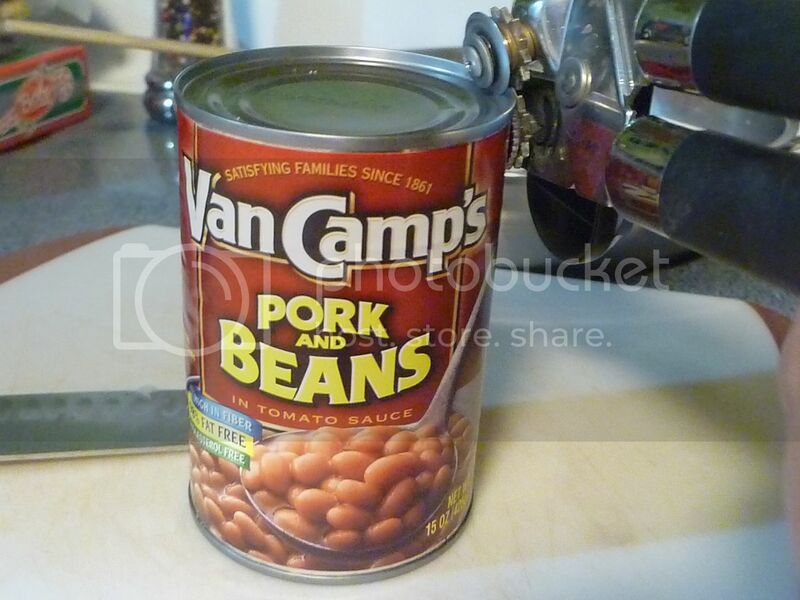 For the bean part of Cowboy Beans, I used a can of pork and beans. 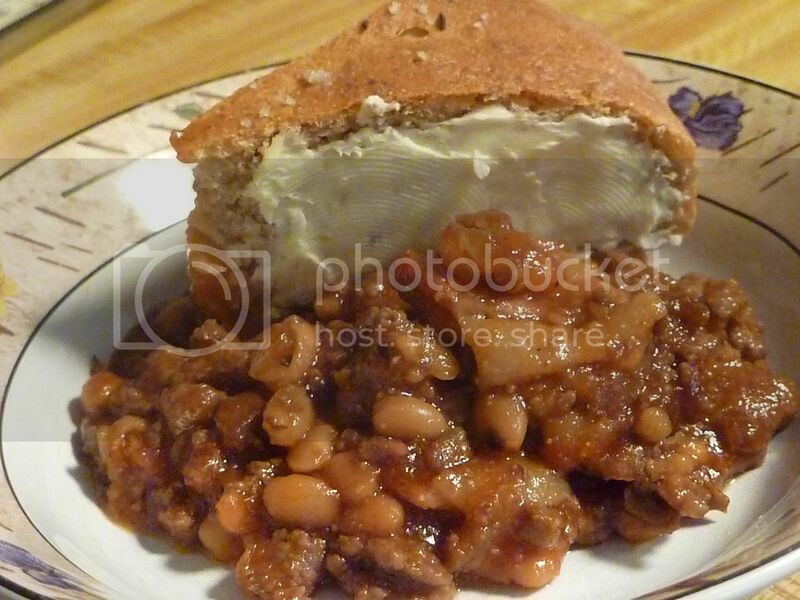 Add the beans to the pan, and stir. 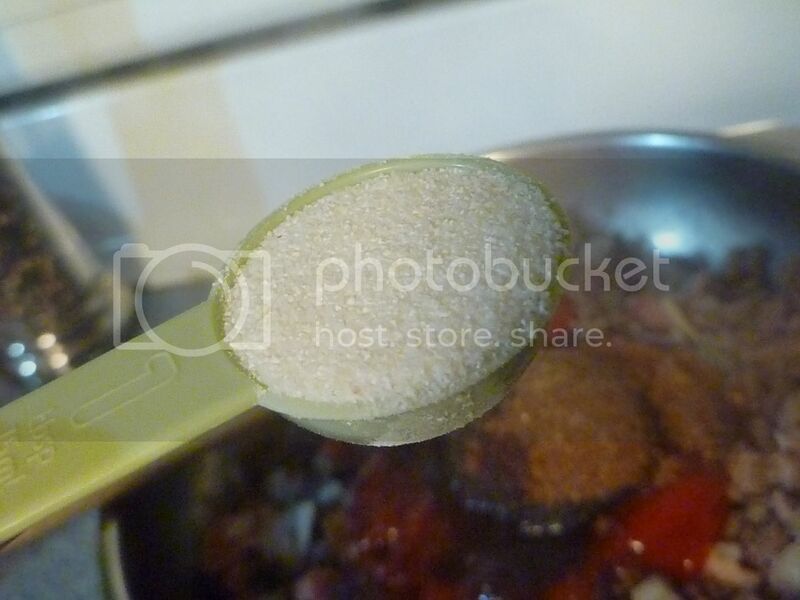 Pour the mixture into a baking dish. Let the beans bake at 350F for around 30 minutes. You could also stick them in a crock pot to keep warm, if you felt so inclined. So simple, easy, and really delicious. I served mine with a buttered hunk of Rye Bread. Best dinner ever. Try it yourself--I dare you! 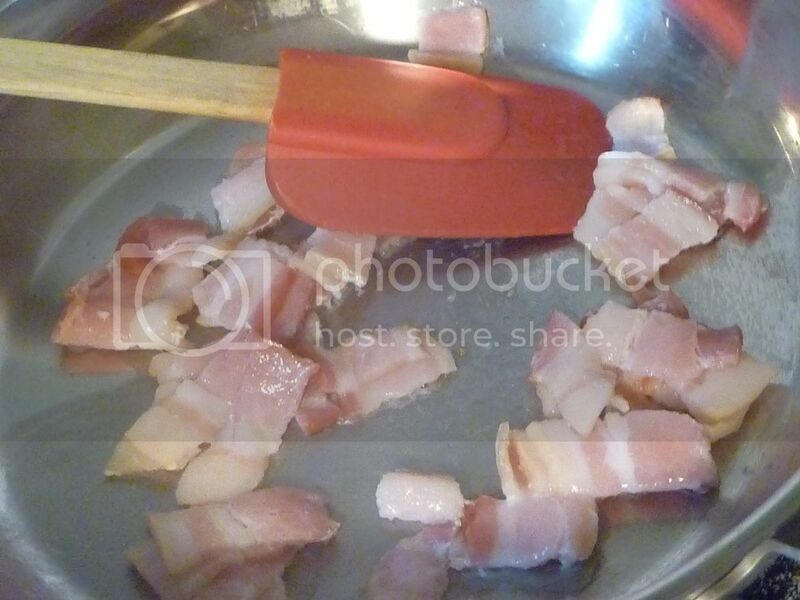 In a large pan, saute bacon until it begins to brown. 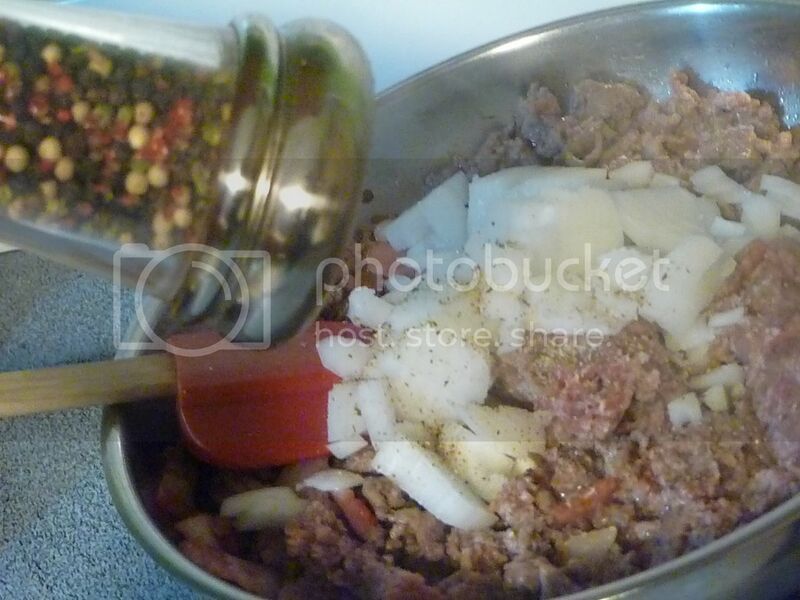 Add ground beef, and cook until browned. 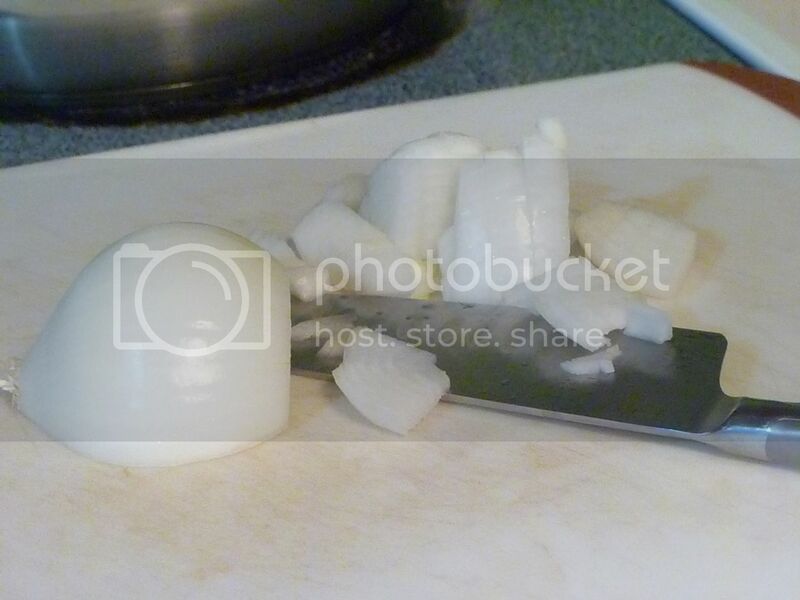 Add onion, salt, and pepper, and saute until onions are softened. 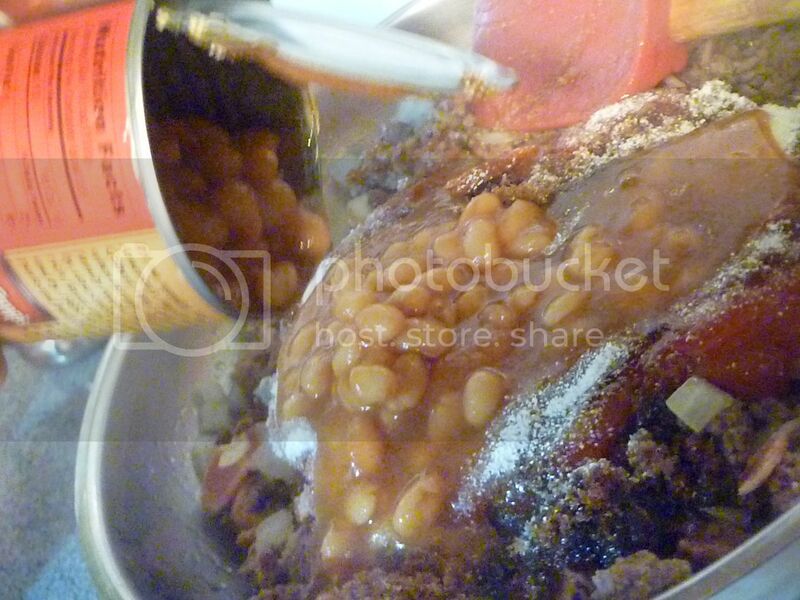 Add ketchup, mustard, brown sugar, vinegar, Worcestershire, cornmeal, and beans. 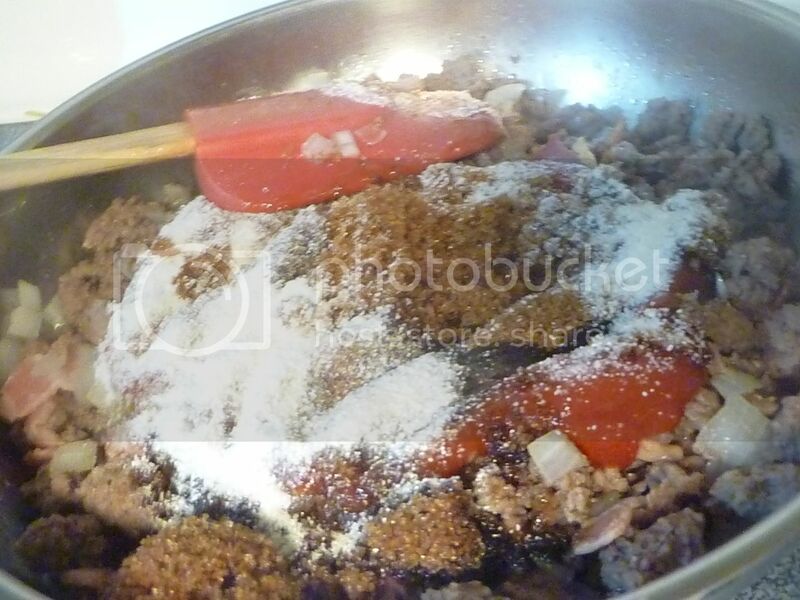 Mix gently and then pour mixture into a baking dish. Bake at 350F for 30 minutes or until everything is bubbly and your house smells like a BBQ joint.